Marrakech (Morocco) (AFP) - Real Madrid defeated San Lorenzo of Argentina 2-0 on Saturday to win the Club World Cup and secure their fourth trophy of 2014. The Spanish giants dominated the final with Sergio Ramos, who had been an injury doubt because of a hamstring strain, and Gareth Bale getting on the scoresheet. Real added the year-ending trophy to the Champions League, Copa del Rey and European Super Cup titles they had already secured in 2014. They will also end the year on top of La Liga. Saturday's triumph was also their 22nd consecutive win in all competitions, and they now have in their sights the mark of 26 straight wins achieved by Johan Cruyff's Ajax side in 1971-72. "We deserved to win the title -- we can say that Real Madrid are the best team in the world," said Real coach Carlo Ancelotti. "We have done really well this year, it's been unforgettable. We are a team and a family." Real are also guaranteed to finish the year as La Liga leaders and Ancelotti was already setting his sights on similar achievements in 2015. "We'd be happy with a repeat. We'll continue forward like this in all competitions and will face the new year with excitement and enthusiasm." Meanwhile, Bale tweeted: "Couldn't think of a better Christmas present, FIFA World Club Champions 2014!! #HalaMadrid." Ramos opened the scoring after 37 minutes when he rose above the San Lorenzo defence to send a thumping header past goalkeeper Sebastian Torrico from a Toni Kroos corner. Bale made it 2-0 six minutes into the second half when he collected a pass from Isco and fired the ball straight at Torrico. But the Argentine 'keeper made a terrible hash of the Welshman's tame shot and fumbled the ball over the line. Real 'keeper Iker Casillas was relatively untroubled, called into serious action for the first time well after the hour mark to keep out an Emmanuel Mas drive. At the other end, Karim Benzema went close to a third Real goal but his touch went wide of the post. Cristiano Ronaldo had a quiet night and failed to get on the end of a Benzema cross in the 80th minute. 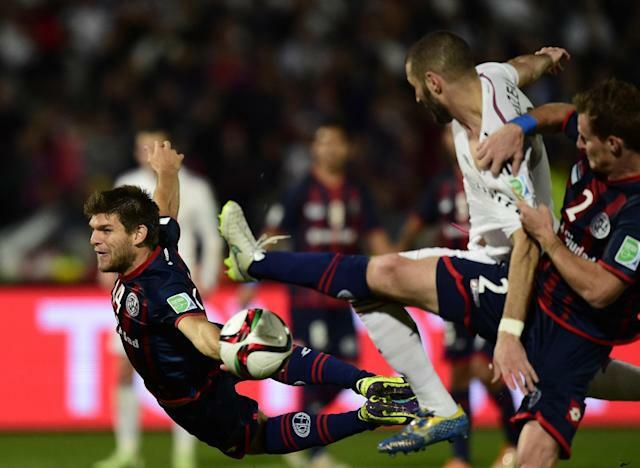 In the last minute, San Lorenzo's Juan Mercier unleashed a powerful, long distance drive which was saved by a diving Casillas. "Madrid won fairly. But for us it was an honour to have finished the year playing in the final of the World Cup. We are very proud despite the grief of losing," said San Lorenzo coach Edgardo Bauza. "It's been a wonderful year for the club and for the fans -- we won the Copa Libertadores." Earlier, New Zealand's Auckland City claimed third place after defeating Cruz Azul 4-2 in a penalty shoot-out to become the first Oceania team to win a medal at the tournament. The two sides were locked 1-1 at the end of normal time with defender Ryan de Vries' goal in first-half injury time equalised by Joao Rojas' close-range effort just before the hour mark for the Mexican side. In the shoot-out, Sanni Issa scored the eventual winner for the semi-professionals from Auckland. The Kiwis had made the third-place play-off by beating Moroccan side Moghreb Tetouan 1-0 and then seeing off African champions Setif of Algeria by the same score. They narrowly missed out on a place in the final when they conceded an extra-time goal in a 2-1 loss to San Lorenzo. "Half of my players are amateurs. We deserve to finish where we have because we’ve been brilliant from beginning to end," said Auckland coach Ramon Tribulietx. "I hope this performance will have a positive impact on football in New Zealand. No one expected us to come third, and it’s a real honour."